PRODUCT DESCRIPTION: Dry powder, much like baby or talc powder, which uses deltamethrin for an active ingredient. Ideal for use in attics, wall voids and crawl spaces, Delta Dust is good for use in the lawn and garden too. Undisturbed treatments can last 8-12 months and will work on a wide range of pests. Its easy to use, non-staining, odorless, and will not clump or absorb moisture. It is safe to use around ornamental plants and grass as well as baseboards and spot treating carpeting and furniture too. Ideal for a wide range of pests applied to cracks, crevices, attics, crawl spaces. Use 1 lb per 1,000 sq/ft for attics and crawl spaces; 500 sq/ft per 1 lb when used outside. Works on a wide range of pests including ants, bedbugs, bees, cadelles, carpenter ants, carpet beetles, centipedes, cockroaches, confused flour beetles, cheese mites, cigarette beetles, dark meal worms, drugstore beetles, fleas, grain mites, granary weevils, lesser grain borers, merchant grain beetles, millipedes, red flour beetles, rice weevils, rusty grain beetles, spider beetles, ants, box elder bugs, cockroaches, crickets, firebrats, scorpions, silverfish, slugs, sowbugs, spiders, termites, ticks, wasps and more! I need to apply dust to my patio. Specifically the limestone tops of counters and sitting walls (about 400 square ft). Does powder spray like a mist that will provide coverage or can I somehow 'spread it'? This duster will help "puff" the dust so it comes out thin and fine making it well suited for surface applications. I just purchased Niban FG, Coquer EC for the cave cricket problem I have. I also purchased Drione Dust two years ago for a carpenter bee problem (which I am glad I bought the drione dust, problem solved). My basic question(s) are: Can I also use the drione dust for the cave crickets? Is the Drione Dust as effective as the Deltamethrin Dust? Do you recommend purchasing the Deltamethrin Dust? Drione is typically more effective compared to Delta Dust. But there are exceptions and in general, it will depend on where you want to treat when making a decision. So for damp crawl spaces, the Delta Dust would be the way to go. It holds up well to moisture and will keep its insecticidal properties longer compared to Drione for such environments. But to keep crickets out of living areas by treating wall voids, cracks and crevices, the Drione would be the better option. 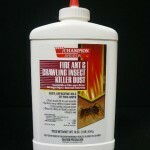 Its highly repellent to insects and they'll avoid where its been applied. But since Drione doesn't do well in moist areas, its generally not the best option for a crawl space. Especially if the crawl is damp or prone to taking in water. Will the Insects killed with dust be harmful to pets that may eat them? No. This is true for a few reasons. First, the dust as is, in the container, has only enough active to affect insects. So in order for it to impact people or pets, we'd have to ingest quite a bit. Since it tastes bad, this is hard to accomplish. Basically our saliva would render any amount on an insect useless once it got wet. That's not to say you should be eating dusted insects but rather to explain the impact would be a non event except for the bad taste. Second, the impact it has on insects will in turn cause them to move about a lot. This will cause most of the dust to fall away so the amount left when they die is usually very small and hard to measure. In fact most will die with no indication it was a dust that did them in. Lastly, any amount left would be insignificant meaning it won't be enough to affect mammals like pets or people. The reality is that the insect itself is probably more of a potential problem since they typically carry a wide range of bacteria, germs and other toxins. For the last several years, I've had a problem with wasp diggers. They are digging holes everywhere and my lawn looks terrible. Will this kill St Augustine grass? In general, digger wasp holes will not kill grass. If anything, they can help your grass and plants because their holes will allow water and other nutrients to "percolate" down into the ground. This will help most plants by getting water and food to their roots. That being said, most people do not feel comfortable with too many in the yard because if you conflict with them, they can sting. And some of the species can be quite aggressive. So if you have "too many" holes and would like to reduce them, get some of the products in our Digger Wasp article and start treating. The dust is the generally the "fastest" way to go and true, treating one nest at a time might seem tedious. But its highly effective and fast acting so you can get control of any problem with little effort. Only had to spray once about 6 times into the hole and have not seen them since. Thanks for the product and the easy instructions!! I am renting a cottage which has a crawl space (all dirt) that I can not get to at all. I have a recurring problem with crickets and other insects coming up and into my living space. The good news is that I can get to the spaces to possibly spray and or put some powder down in through the thin space with the proper tools/equipment. There is a small boiler room where I do notice the insects like to crawl up and into that heated area. What can I use to get into the crawl space via thin openings between the floor and the crawl space? I will be buying silicone sealer and wire to block of the spaces once treated. The dust above would be ideally suited for this space. Once applied properly, insects will not able able to use the space for 1-2 years. That being said, you'll need at least one good access point to get the dust applied. And you'll need to use our Dustin Mizer to make the application or our Rental Duster. The effective "range" of the Dustin Mizer is less than the electric duster but if the space is 20 feet or less wide, it might work assuming you have a mid way entry point to get it applied. As for using "silicone sealer" after you treat? We advise against this. Keeping access to the space would be very smart so that in the future, you can use the point of entry to see what's going on in the space. Also remember that insects don't initially come from such spaces. Firs they migrate into them by gaining access from outside which means you'll need to treat the perimeter of the home as well if you want to establish long term control over any perimeter invading pests. More on how to do this can be read about on our site in most any article but our Camelback Cricket article details this well. Great stuff! 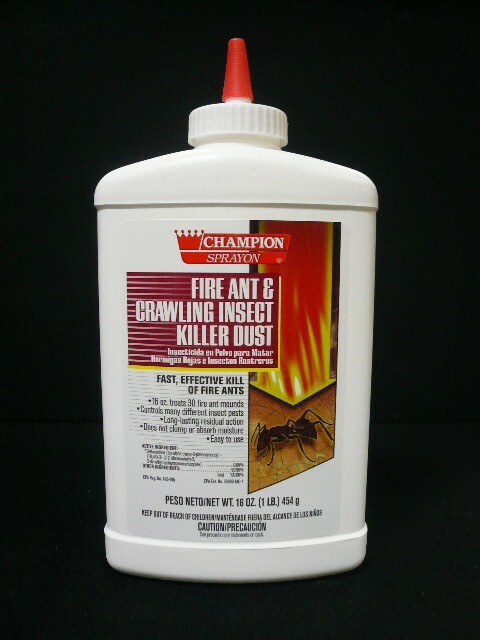 This product got rid of an infestation of cave crickets at a bargain price. Much cheaper than an exterminator!